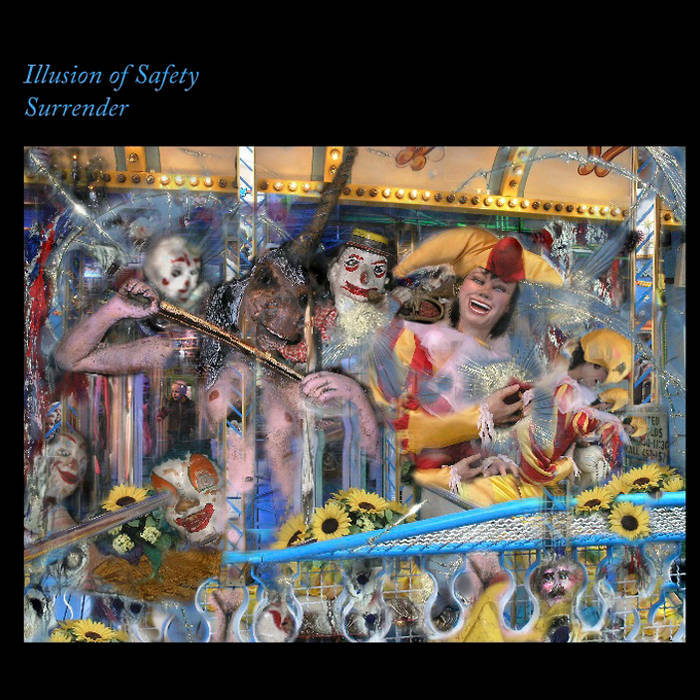 Industrial rust, unhinged floating melodies, and sharp stabs of noise all populate this all-too-worthy example of what Illusion of Safety is all about. There is a tangible feeling of dread, flavored with a dash of sideshow glee in these maddening halls of three-o'clock-in-the-morning, broken television violence. Every track drips with decades of clown makeup and dispair. Each new rhythm is another malfunctioning carnival ride. Each new field recorded sound is another basment laboratory full of electrical code violations. Why is this album called "Surrender?" Because that is what you must do. There is no way to resist it; it is going to get inside anyway. It crawls on its greasy underbelly under your locked door and plants itself firmly in your consciousness. It pierces your defenses with a small, organic drill - and injects terror into your veins. This is skillfully excecuted skull-scraping, replete with humming, overheated tesla coils, and science fiction equipment of the most far-fetched variety. Whirs and beeps and buzzes envelop the listener, (or test subject - you decide,) in choking clouds of overpowered circutry poised to kill the power grid at any moment. As each questionable machine breathes its last sputtering breath, and the pools of battery acid begin to dry, leaving their discolored epitaphs on the cement floor, the listener knows that they were in the professionally trained hands of master noise-makers at the top of their craft. Newer PostTHE GUILTY REMNANT - "The Guilty Remnant"
Older PostMONOCHROMACY - "Living Posture"